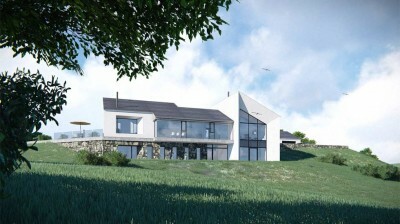 Located in Malin, Co. Donegal this split level family house is carved into the site contours to give an integrated appearance with the land, provide shelter and warmth whilst capturing views & solar gain on the south. In the past traditional buildings in Donegal have demonstrated basic functional scale with simple proportions and little or no decorative detailing. Simple vernacular rural dwellings were generally rectilinear in plan, usually no more than one room deep, with gable end details or simple mono-pitch details. From the second half of the 19th century corrugated iron and slate replaced thatch as a dominant roofing material. Our primary aim with this house was to provide our clients with an innovative design that is contemporary and of its time whilst reflecting the design features and characteristics that contribute to the rural character of Donegal - strong simple geometric forms. The house is a split level building; two storey as perceived from the south side and a single storey structure as perceived from the north side. A stone clad plinth is proposed to link the building with the landscape at lower level. Taking reference from traditional rural homes, the majority of the windows have a high solid to void relationship and a simple symmetrical arrangement that frees up other walls for total transparency to capture views and sunlight. The scale of the house and garage are relevant and respectful to the size of the site and its surroundings. Proportion, form and scale are fundamental and a very significant part of the proposed design. The design strategy for the proposed house has been informed from the indigenous Irish narrow plan homestead. The aerial footprint of the house is loosely a 'T' shape with two linear blocks of vernacular proportion running at 90 degrees to each other. Each block has a simple mono-pitch slate roof. These blocks are lightweight on the south and west elevations to maximise views and passive solar gain and solid on the north and east elevations to maintain heat and privacy. Whilst the shape of the building is reflective of simple vernacular forms, the proposed finishes applied are high quality and reflective of the vernacular palette. White rendered walls will provide a strong contrast with the local stone clad plinth. Zinc downpipes and guttering are carefully positioned and detailed to continue the tradition of simplicity. Cedar cladding strategically positioned will compliment the white walls, enriching the house's appearance. In summary, this house is a modern representation of the Irish vernacular, it is simple, honest and has, we believe unobtrusively nestled into the subject site whilst maximising views, shelter and sunlight.